Destinations Included :Delhi - Rishikesh - Devprayag - Joshimath - Badrinath - Rudraprayag - Haridwar - Delhi - Bhubaneshwar - Jagannath Puri - Bhubaneshwar - Chennai - Rameshwaram - Madurai - Dwarka - Rajkot - Mumbai The Char Dham tour package is an ideal pilgrimage tour for those pilgrims who do not know much about the unique landscapes and also the significance, the four most sacred places, mentioned below, hold in India. Gangotri, Yamunotri, Badrinath and Kedarnath have a magical charm, with their divineness and also enjoy and are of great significance for the devotees that leave them awestruck. Apart from the above mentioned the package also gives you a unique experience of visiting other important sacred pilgrimage sites in Bhubaneswar, Madurai, Rameshwaram and Mumbai. The tour of Char Dham begins from the capital, Delhi. From Delhi leave for Haridwar (224 kms) that is a six-hour drive. Reach Rishikesh, which is the entrance to the mighty Himalayas. 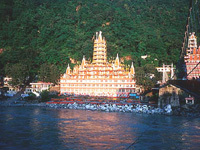 Rishikesh is the gateway to the Char Dham pilgrimage tour. Situated in the Tehri-Garhwal region in the state of Uttar Pradesh, Rishikesh has nature's bounty. The quiet flow of the holy river, Ganga in the Himalayan foothills presents mystique splendour. Near the banks of the river Ganga, are many Hindu temples. Placed at about 1360 feet above sea level, Rishikesh is where Lord Vishnu killed the demon Madhu. A temple dedicated to Lakshman lies on the other side of Ganga, in Tapovan. Here, Lakshmana and his brother Bharata are believed to have done heavy meditation. The Swargashram and the Geeta Bhavan temples are tourist hotspots. Also, is the Lakshmana Jhula that is a 450 feet long suspension bridge built in 1939. Added to the attractions recently is the Ram Jhula. Early in the morning, leave for Joshimath / Rudraprayag through Devprayag, Ruderprayag, Karanprayag and Nandprayag (243 kms). It is a nine hours drive from Rishikesh. The intersection of the two famous rivers is a must visit tourist spot. From there, go to Joshimath through Chamoli and Pipalkoti. 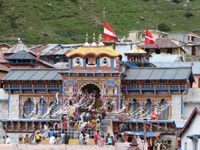 Once arrived at Joshimath in the late afternoon, pay a visit to Adi Guru Shankaracharya seat and the Narshimha temple. With extra cost, you can visit Auli (famous winter hill resort for skiing) by the cable car. You will be spending the night at Joshimath or Rudraprayag. Early morning, proceed to Badrinath (31 kms) from Joshimath / Rudraprayag. You will reach Badrinath (by approximately 11 am). It is a major pilgrimage site in any religious India tour in the north. Representing one of the four dhams in India, Badrinath is located at an altitude of 3133 mts. above sea level. On both sides of Badrinath are the two mountain ranges of Nar & Narayan with the tall Neel Kanth Peak in the background. The name "Badri (Van)” means a forest of berries as Badrinath was once upon a time covered with wild berries. Alakananda river can be seen flowing beside the temple. A hot water spring named Tapt Kund lies facing the temple. Dedicated to lord Vishnu, the 15 mts high Badrinath temple is in the shape of a cone with a small cupola of a bull and spire. Its existence is accounted much before the Vedic age. The tours can be extended to the Valley of Flowers and Hemkund sahib on request. From Badrinath, leave for a 6 hrs drive to Rudhraprayag (160 kms away). You will spend the night at a hotel, there. Go to Haridwar (170 Kms) that is a 5 Hrs drive from Rudraprayag. Haridwar is the starting point of the pilgrimage tour to the four holy sites of Uttaranchal. The tour will take you to the sources of the holy rivers, Ganga and Yamuna. Legend says Prince Bhagirath meditated here, to rest the soul of his ancestors, who perished after the curse of Sage Kapila. The meditation paid off and the river Ganga thus began to flow from Lord Shiva's locks of hair. The abundant water of the Ganga revived the sons of King Sagara. Hindus are ardent devotees of the sacred water of the Ganga, praying for the salvation of their ancestors. Even foreigners make a pilgrimage India tour. The important places to visit are Har Ki Pauri, Chandi Devi, Mansa Devi, Kavand Mela, Daksha Mahadev Temple, Sapt Rishi, Maya Devi etc. Leave for Delhi (222 Kms) that is a six hours drive from Haridwar. In the afternoon, you will be having some free time to leisure around. Catch the flight from Delhi to Bhubaneswar. Once arrived, head to Puri from there. Being 56 kms it is approximately a 1 ½ hrs. drive. On the way visit the famous Sun Temple at Konark.You will be spending the night there. Take a morning visit to the Jagannath Temple in Puri. 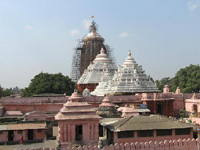 Built in the 15th century AD, the Puri Jagannath Temple is famous. Crowned with Vishnu's wheel and flag, it is an important landmark in the town of Puri. The temple has intricate carvings of Oriyan style architecture. You will be spending the night in Puri. Lord Jagannath is the prominent deity in this temple along with Balabhadra, Subhadra, Sudarshan, Madhaba, Sridevi and Bhudevi on the Ratnabedi or the bejewelled platform. The Deities of Lord Jagannath, Balabhadra, Subhadra and Chakra Sudarshan are of margosa wood. In the morning head back to Bhubaneswar to catch flight to Chennai.You will meet one of our representatives in the airport who will guide you to the hotel. Head to the Chennai airport to catch the flight to Madurai. Once arrived, take a drive to Rameshwaram that is 167 kms and a 4 hrs drive. Stay the night there. Spend the full day sightseeing Rameshwaram. Rameshwaram is an island cut off from mainland India. It spreads over 56 km and is full of casuarina trees and stark palms. 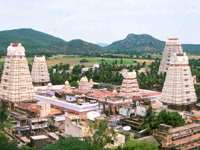 Rameshwaram is a holy place for Hindus. It is where Lord Rama cleansed himself by worshipping Lord Shiva after committing the sin of killing the demon Ravana. Hindus who take a dip into it consider the water of the Agnitheertham as holy. Turn back to Madurai to catch the flight to Mumbai. You will be staying at night in the hotel. From Mumbai, fly to Rajkot to spend the night there. Head to Dwarka (238 kms away) that is approximately a 5 hrs drive from Rajkot. Go around the city for sightseeing in the afternoon. Lying on the corner of the peninsula of Saurashtra, Dwarka is a holy historical city. Thousands of years ago Lord Krishna left Mathura, his birthplace after having found Dwarka. It served as the capital of his empire. The Dwarkadhish Temple is the main tourist hotspot, here. You will spend the night out there. Head back to Rajkot after breakfast. Once arrived at the Rajkot airport fly to Mumbai to spend the night there.